We are through four weeks through the NFL season, which means it’s time for the fourth update in the race for PFF’s Rookie of the Year award. In this week’s update, we welcome two newcomers into our top-10, and we also have a new leader, as someone has knocked Los Angeles Chargers safety Derwin James off of our top spot after one week. As always, the full top-10 along with the honorable mentions can be found below! Mayfield shoots straight to the lead in this race after making his debut in the No. 10 spot last week. The former Oklahoma star ranks sixth among all quarterbacks with an 88.2 overall grade, earning grades in the mid-80s in both games he’s played thus far. 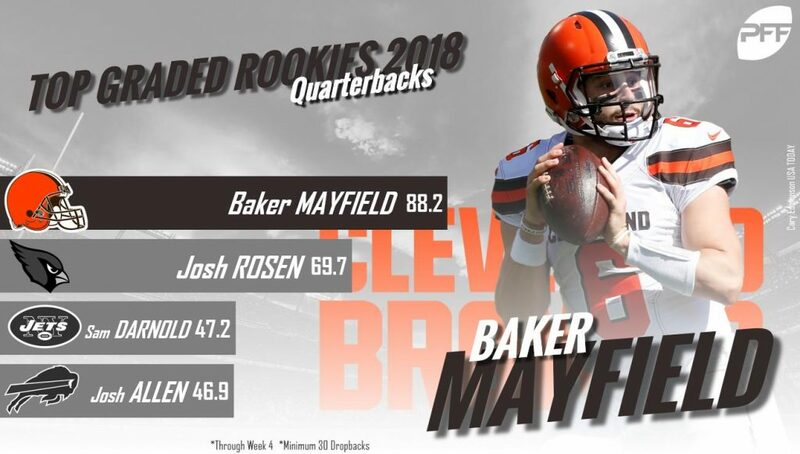 Despite just playing three halves of regular season football, Mayfield ranks 19th among all quarterbacks with six big-time throws, and he’s pushing the ball downfield. Mayfield’s average depth of target of 10.8 yards ranks seventh among qualifiers. The No. 1 overall pick has looked as good as advertised so far as a pro. James was sensational for the Chargers in the opening month of the season, and he currently ranks seventh among all safeties in terms of overall grade. James has truly done it all on the defensive side of the football: He’s tallied two pass breakups along with an interception in coverage while holding opposing signal-callers to a 46.2 completion percentage when he’s the primary coverage defender. He also ranks 20th out of 89 qualified safeties with a 71.4 run defense grade and leads all safeties with nine total pressures as a pass-rusher (nearly doubling Jamal Adams who is second among safeties with five pressures). 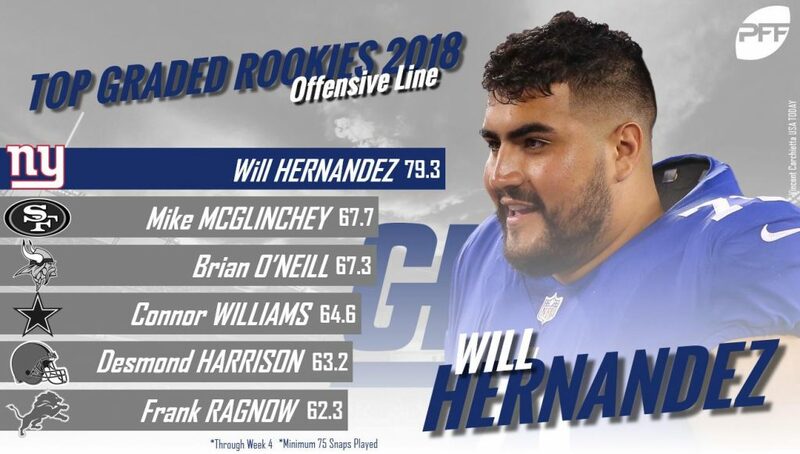 Hernandez ranks third among all guards in terms of overall grade so far this season, and he’s getting the job done both in pass protection (78.2) and as a run blocker (74.8). Hernandez has graded out north of 70.0 in each of his last three games and after allowing two pressures in pass protection in both Weeks 1 and 2, he’s posted clean sheets in both games since. Making his debut in the top-10, Vander Esch currently ranks sixth among linebackers in terms of overall grade. The 19th overall pick has seen his playing time steadily increase over the first four weeks of the season and against the Detroit Lions this weekend, he made his first start, seeing 50 defensive snaps and posting an 80.6 overall grade. Vander Esch ranks fourth among linebackers who’ve seen at least 40 snaps in coverage this season by allowing just 5.6 yards per catch, and he’s been incredibly impressive as a tackler: His 21 tackles are the second-most by a linebacker who is yet to miss a tackle this season. 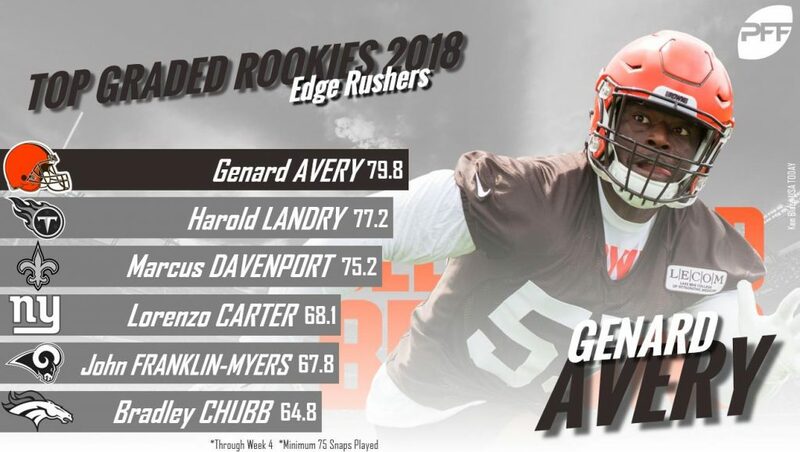 The second member of the Cleveland Browns to appear on this list, Avery ranks 13th among edge defenders in overall grade, and his 77.3 pass-rush grade ranks eighth. The fifth-round pick set a new career high this past weekend in Oakland with five total pressures, four of which ended up with Derek Carr on the ground (one sack and three hits). Right on his teammates’ heels, Ward makes it three Browns in the top-six spots in the race for our Rookie of the Year award after one month of the season. Ward ranks 10th among cornerbacks in terms of overall grade, and he sits at third among cornerbacks with an 82.4 coverage grade. The fourth overall pick collected another pass breakup in Week 4, giving him two on the season to go with two interceptions. Opposing quarterbacks have a 59.3 completion percentage when targeting Ward this season, and he’s surrendered just three catches on 10 targets over the past two weeks. 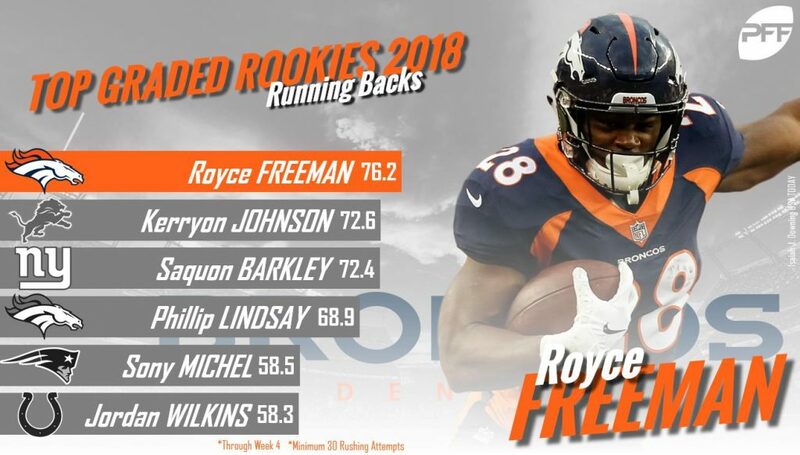 Freeman ranks sixth among running backs in terms of overall grade, and his 75.1 rushing grade also checks in at sixth. He ranks third among running backs with 10 runs going for at least 10 yards, sixth with an average of 3.59 yards after contact per attempt and his 12 forced missed tackles on rushes ranks third. The third-round pick has averaged at least 3.77 yards after contact per attempt in each of his last two games, earning a grade of at least 73.7 in both contests. Hand currently ranks 17th out of 117 qualified defensive interiors in terms of overall grade, and he’s been a steady presence for the Lions’ defensive line, scoring overall grades of at least 77.6 in three of their first four games. The fourth-round pick out of Alabama had his best game as a pass-rusher in Dallas this past weekend, tallying two pressures (including one sack) and stripping Dak Prescott with just two minutes to go in the fourth quarter as the Lions attempted to stop a Cowboys comeback. 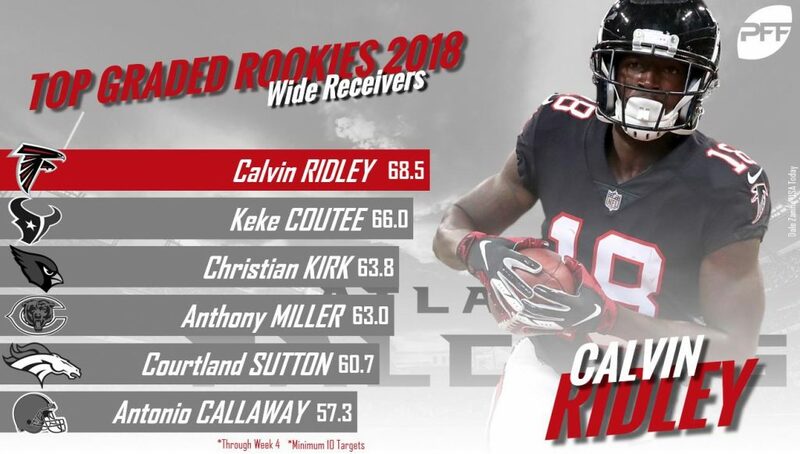 Checking in just one spot behind his former Alabama teammate, Ridley ranks 25th among 96 receivers who’ve seen at least 10 targets this season with a 75.3 receiving grade. He ranks 18th among that group with an average of 2.28 yards per route run, he’s hauled in all three of his catchable deep targets thus far – scoring touchdowns on all three – and his quarterback has a 153.3 passer rating when targeting him, which ranks fourth among all receivers. Barkley ranks 16th among running backs in terms of overall grade, boosted by an 80.9 receiving grade that ranks eighth among running backs. The second overall pick ranks ninth among backs with an 86.7 elusive rating, which measures the success and impact of a runner with the ball independently of the blocking in front of him, and his 21 combined avoided tackles – both as a runner and receiver – ranks third, just behind Marshawn Lynch and Kareem Hunt who have each forced 22 missed tackles through four games.